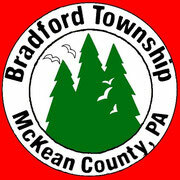 EFFECT IMMEDICATELY THERE WILL BE NO MORE RECYCLING BINS LOCATED AT BRADFORD TOWNSHIP LOCATION. PLEASE DO NOT BRING OR DROP OFF ANY RECYCLING MATERIALS AS THESE BINS WILL ALL BE REMOVED BY FRIDAY, JULY 27, 2018. Beginning August 1, 2016 signs and posts will be available for purchase at the cost of $20.00. You will pay for the signs at the time you pick them up. Signs will be at the Bradford Township Volunteer Fire Station at 368 Interstate Parkway. The hours that you can purchase signs will be Monday thru Friday from 9:00 a.m. to Noon and on Saturday, August 13th, August 20th and September 10th from 9:00 a.m. to Noon. The pick up form is available for download. Please take this form with you. *If you choose to purchase you own sign and post please review Ordinance #2016-03-01 for the specifications of the signs. Need to know if your property is in a floodplain area? Call FMIX at 1-877-336-2627 for assistance or choose the link below for additional information and floodplain maps. NOTE: All files on our site are formatted as PDF files. In order to view them you need the latest version of Adobe Reader available as a free download at: http://get.adobe.com/reader/.